Chesters Popcorn Flamin Hot - 6 _ oz. 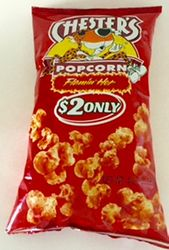 Chesters Popcorn Flaming hot are crispy, popcorn shaped treats with delicious flavoring. So Watch Out! (There is a fire in this bag) These tasty snacks are hot - Flamin' Hot! Do you dare? Get ready for a sizzle of flavor that will set your mouth on fire. Dive into a red hot blaze of fiery crunch with Chester's Brand Flamin' Hot puffed corn snacks. If you dare! Serving suggestions: You can eat them right out the bag while watching the game, movie or your favorite t.v. show, take them to the beach, on bbqs, picnics, by the pool, or enjoy them along a sandwich or hot dog. Tasty and Crunchy Hot Puffed Corn Snacks! Ingredients: Enriched corn meal (corn meal, ferrous sulfate, niacin, thiamin mononitrate, riboflavin, folic acid), vegetable oil (contains one or more of the following: corn, soybean, and/or sunflower oil), salt, corn, maltodextrin, cheddar cheese (milk, cheese cultures, salt, enzymes), yeast extract, sugar, monosodium glutamate, artificial color (red 40 lake, yellow 6 lake, yellow 5, yellow 6), whey, citric acid, onion powder, garlic powder, buttermilk, natural flavor, lactic acid, sodium diacetate, nonfat milk. Las palomitas de maiz picantes de Chesters son crujientes, botanas en forma de palomitas de maiz con un delicioso sabor. Asi que ten cuidado! (Hay fuego en esta bolsa!) Esta sabrosa botana es picante flamin hot! Te atrevez? Preparate para un delicioso chisporroteo de sabor que prendera tu boca en fuego! Sumergete en una roja llamarada crujiente de fuego con la botana flamin hot de la marca Chesters.. Si te atrevez! Puedes comerlas directo de la bolsa mietras ves el juego, una pelicula o tu programa de television favorito, llevalas a la playa, en barbacoas, picnics, en la alberca, o disfrutalas junto con un sandwich o hot dog! Sabrosos, Picantes y Crujientes botanas de maiz inflado! Ingredientes:Harina de maiz enriquecida (Harina de maiz, Sulfato Ferroso, Niacina, Mononitrato de Tiamina, Riboflavina, Acido Folico), Aceite Vegetal (Contiene uno o mas de lo siguiente: Maiz, Aceite de Soya y/o Girasol), Sal, Maiz, Maltrodextrina, Queso Cheddar (Leche, Cultivos de queso, Sal, Enzimas), Extracto de levadura, Azucar, Glutamato Monosodico, Color Artificial (Rojo 40 Laca, Amarillo 6 Laca, Amarillo 5, Amarillo 6), Suero de Leche, Acido Citrico, Cebolla en Polvo, Ajo en Polvo, Suero de Leche, Sabor Natural, Acido Lactico, Diacetato de Sodio, Leche Descremada. This popcorn is the best!!! ConsIt's only available at this store. when i tried this popcorn for the first time i fell in love with it.it is the best hot popcorn on the market,if you like hot well this is very hot,i absolutely love it.the only down fall with this is that the only way to purchase it is to order online.i found it originally in a small country store then went back to get more and they couldn't get it anymore so now i order online lots of it at a time so i don't run out.